I ran across this fine member of the Ford family from a good friend .It is a half year car some call it a 1963 &1/2 they are very much a 1963 but have different roof line and trim. This has the big block engine 352 cu in I believe ....haven't checked to hard but for all I know It could be a 390 or 406 but numbers say 352 according to vin numbers. 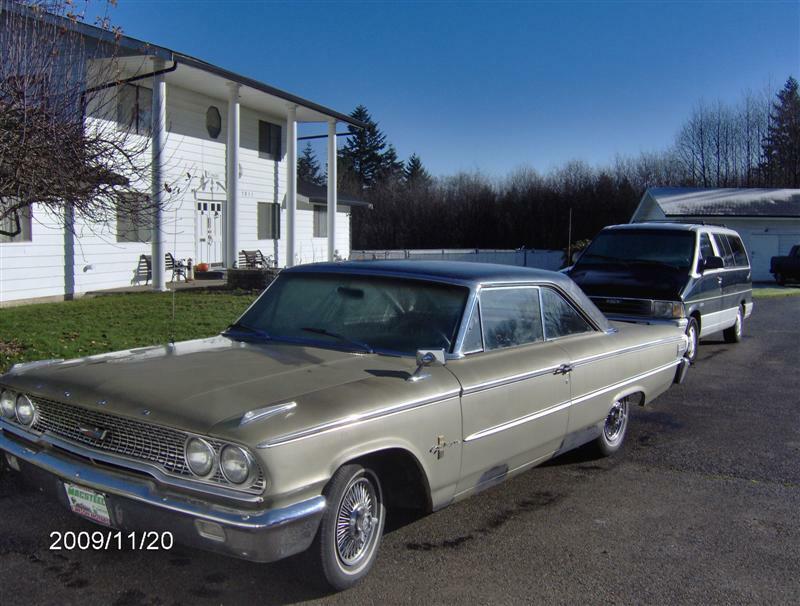 This is a bucket seat consol car Galaxie XL 500 It has the cruise o matic transmission with a 9 in rear end. I was lucky enough to get all the original hubcaps, It drives well and the dual exhaust sounds great. I plan on doing a little body work and painting it. Recently picked up a correct carburetor intake four barrel manifold, although the two barrel works well and mileage is around 16 mpg. This is the car you can really hit thre road with, kinda like 4 wheel happy hour in a time machine.